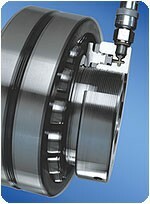 SKF Hydraulic Nut Maintenance/Repair Parts Reliability Direct, Inc. Your Direct Source for Reliability, Maintenance, Test & Measurement! If oil leaves the hydraulic nut when the piston is operated, this generally means the seal is torn or damaged and must be replaced. Using the threaded pins supplied with the nut, the piston can be pushed out of the ring. The O-rings are then removed, the grooves cleaned, and the new O-rings put in position. A spare set of O-rings is also supplied with the nut.